The leaves are changing and the air is getting crisp outside, so "Happy Fall Y'all!" Time to enjoy family and friends during football games and dinner parties. 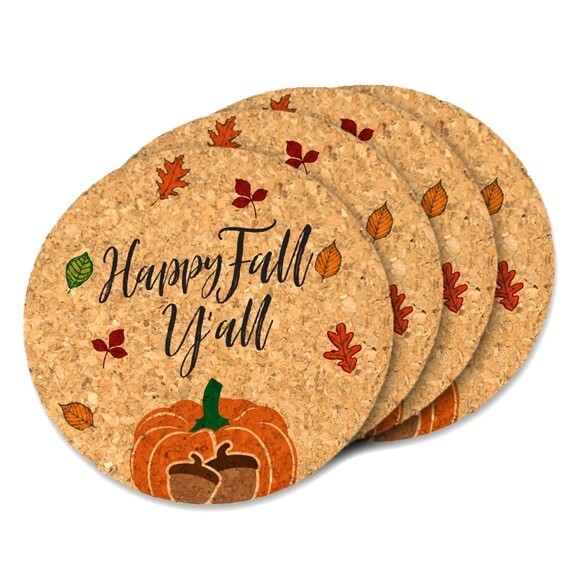 These colorful cork coasters will enhance your fall décor. As you plan out your fall fun you will need to order many sets to help you celebrate this wonderful season. Coasters are crafted from 100% renewable, all natural cork. PLEASE NOTE: Non-personalized. Sold as a set of four (4) and prices quoted are per set.